We are continuing with Hockey Week today with something very near and dear to my heart, Fantasy Hockey. 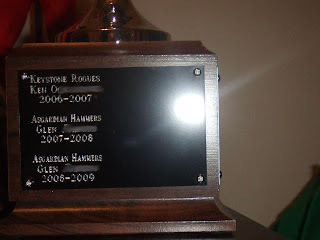 I got invited to my first league during the 05-06 season and was hooked. The other people in that group weren’t the people I wanted to be dealing with though, so the next year I started my own over at Yahoo. By now you know I’m a comic geek and so are many of my friends, so when I started a league it was all comic based. 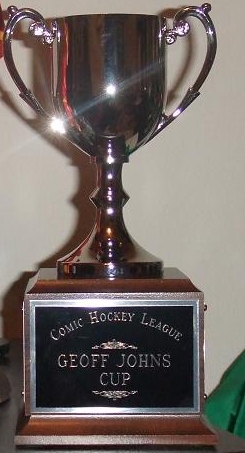 The Comic Hockey League was born. So how do you make a Fantasy League comic book themed? It’s all in the names of the teams. Over the years we’ve had Asgardian Hammers, Windy City SuperPros, Coast City Lanterns, and San Futuro Sharks and many more. Personally I’ve tried to change up my team every year so I’ve been the Keystone Rogues, Quad City Wild Dogs, K’un-L’un Iron Fists, Central City Speedsters, and this year’s team, the Opal Stars. We also have our own trophy, the Geoff Johns Cup. There was a moment where we almost went with the very punny Stan Lee Cup. Instead we went with a comic book professionally who I knew appreciated hockey and someone I knew that I could get their blessing for naming the trophy after them. Sure we could have named the trophy after him without telling him, but it just felt better checking with him first. Yahoo just added the ability to record Hits and Blocked Shots and I think it is a huge improvement to their tracking. Finally defensive players get a chance to shine. The extra options I think also balance our league between Forwards, Defense, and Goalies. The years before were probably too Goalie-centric, but now it is perfect. I took a huge chance during this year’s draft and it is paying off big time so far, but we’ll see how I’m doing after the all-star game. Of course if you have any good Fantasy tips, let me know.